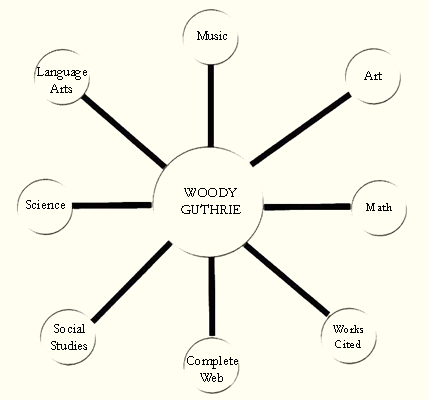 Discover ways to implement thematic curriculum on Woody Guthrie incorporating Writers Workshop and Literature Circles. Suggestions for Responses to Literature include many open-ended activities to use throughout this unit including dust bowl journals, a newspaper and graphic organizers. Woody's "Dust Storm Disaster" chronicles the devastation of the Dust Bowl. What were the causes of this phenomena? Was it simply the weather? Explore the role of natural and human causes on the environment. Discuss alternatives to destructive land use. Delve into some of the social justice issues during Woody's time, especially the plight of workers and the role of unions. Use resources to assemble a web of common goals shared by union members. Ideas for making a larger-than-life size Woody Guthrie Timeline are included to give children an opportunity to sequence events and get a feel for his life. Woody sings about migrants leaving the Dust Bowl traveling from Oklahoma to California, looking for work. Teach how to use scale and compute distances using a map of Route 66. Find activities for developing word problems based on authentic problems, such as the distance from Oklahoma City to Winslow, Arizona. Woody wrote over 1,000 songs and left behind even more lyrics. Develop your classroom library of CDs and tapes including songs Woody wrote for his children. Since your students will be learning so many Woody Guthrie songs, find out how to plan and carry out A Family Night Sing Along. Did you know Woody Guthrie was a visual artist? Watercolors embellish his journals and lovely black line drawings reflect his way of seeing the world. Use Woody's artwork to teach the elements of line, shape, color and perspective and enrich the studio work of your students. Here are books for children and books to use as classroom resources while teaching a unit on Woody Guthrie. Suitable for literature circles, read-alouds or research, these books feature archival materials. Designed by Theresa Kubasak, this Curriculum is designed for teachers to engage their students in the areas of history, music, art, science, math, and writing by using the words, art, and life of Woody Guthrie. Above is the curriculum web at its most basic. You can click on any of the areas to take you to that section. See Theresa Kubasak's curriculum web as an example. It includes a section-by-section breakdown. Refer to this page for information about the artwork, its source, and copyright information.